Mountains and oceans are barriers no more for players of Final Fantasy Versus XIII, through the return of the classic airship. Square Enix's Tetsura Nomura is known for his work on many popular videogame properties over the years, including Final Fantasy and Kingdom Hearts. His current PS3-exclusive project, Final Fantasy Versus XIII, is set within the same universe as the recently released Final Fantasy XIII, but is said to be mostly unrelated. In a recent interview done through Square Enix's Japanese Twitter account, Nomura has confirmed that airships will make a confident return in Versus XIII, as their full functionality has been sorely missed in current Final Fantasy games. When asked how development was progressing on Versus XIII, Nomura's reply translates to: "Not everything is connected together, so the various areas have different levels of progress. However, you can fly across the world map in an airship." A seemingly minor comment, but to fans of the more traditional versions of Final Fantasy it could be very meaningful. 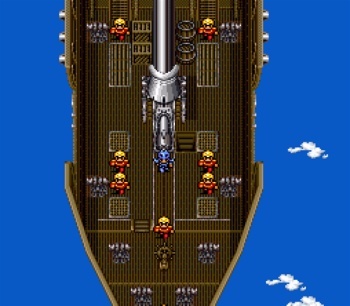 The airship is a gameplay aspect that dates all the way back to the very first Final Fantasy for the NES. Anyone that has played Final Fantasy no doubt has a mental image of that first airship rising from the desert sands, and I'm not going to say it was the first RPG to include the feature, but the airship has been an integral part of almost every Final Fantasy since the beginning. This basically changed with Final Fantasy X, after which navigation on the games' world maps worked differently. More than just a form of quick travel, the airship symbolized freedom and non-linearity, giving players the ability to explore previously inaccessible areas and to find hidden secrets. Final Fantasy XIII is often attacked as a linear experience, and with only 12 hours into the game my experience has confirmed those attacks, though I hear it gets better later. Still, earlier Final Fantasy games gave a feeling of freedom and excitement right from the beginning, rather than locking players into a set path and shoveling them along it. For longtime Final Fantasy fans, the mere existence of an airship in Final Fantasy Versus XIII that can be flown across a world map could mean the return of gameplay aspects some were looking for in Final Fantasy XIII. The keyword here is "could," but the hope is now at least there in some form.